Diaphragm pressure gauges, like every device and instrument intended for use in industrial process measurement and control, have their own set of attributes making them an advantageous choice for some range of applications. Silvia Weber, product manager at Wika, a globally recognized leader in the field of pressure and temperature gauges, wrote an article for Process Worldwide (process-worldwide.com/) about diaphragm pressure gauges. The article is included below and provides a comparison of the differences between Bourdon tube and diaphragm operating mechanisms, focusing on design and operational features of diaphragm pressure gauges and the range of application criteria for which they may be the best choice. 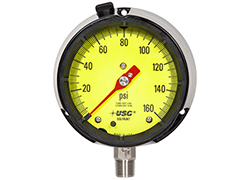 Pressure gauges are utilized in most operations where fluids are moved through a system. 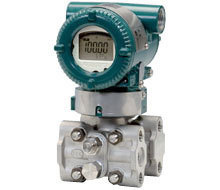 Gauges, though mechanical in operation, remain a mainstay of fluid operations because of their reliability, local display, ruggedness, and lack of reliance on electric power for operation. 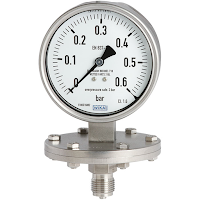 There are countless pressure gauge configurations to suit every application. Specifying the best gauge configuration for an application is accomplished by combining your process knowledge with the application expertise of a product specialist. 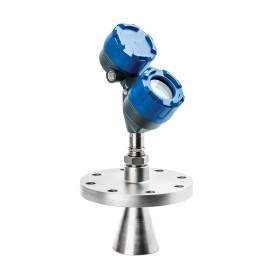 Applying Diaphragm pressure gauges in industrial settings from Miller Energy, Inc.
Pressure gauges and transmitters, commonly found in fluid process control operations, are vulnerable to damage from transient spikes in system pressure that may range beyond the instrument's working range. 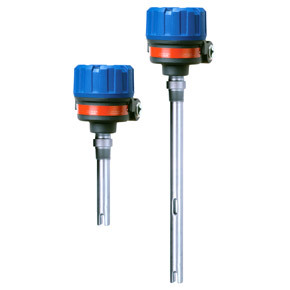 These pressure spikes can impact instrument calibration, or even render the instrument or gauge inoperative. 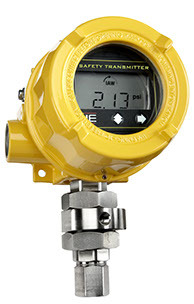 The cost of replacing gauges or transmitters is substantial enough to warrant the use of protective devices to prevent exposure to pressure spikes. 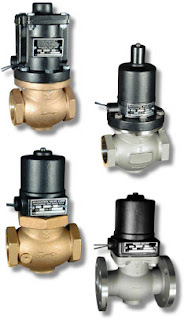 Mid-West Instruments manufactures a line of pressure limiting valves specifically intended for use with pressure gauges and transmitters. 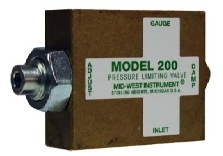 The Model 200 pressure limiting valve prevents instrument over-range and has an adjustable needle valve to dampen pulsation. 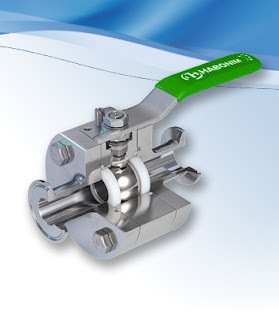 The valve and be used with all types of instruments and pressure gauges, is suitable for mounting in any position, and is available in a range of materials for body and seals. The document below provides more product detail, as well as installation and setup instructions. Providing a useful measure of protection for pressure gauges and transmitters is a simple operation. Reach out to product application specialists for help in formulating effective solutions. 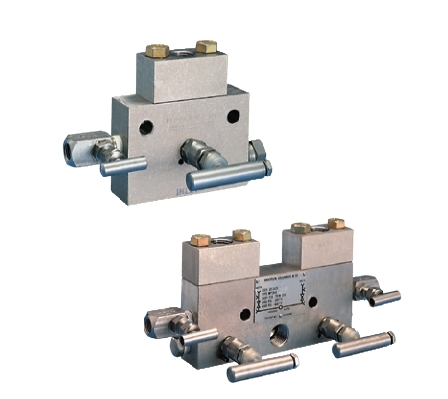 Pressure limiting valves for transmitter and gauge protection from Miller Energy, Inc. 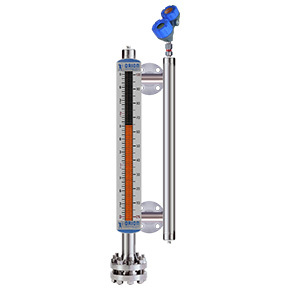 Even with the large growth in the use of electronic measurement instruments throughout the process control sphere, mechanical gauges and indicators remain an important part of process measurement and control operations. 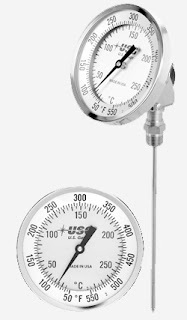 A broad line of industrial gauges and diaphragm seals is available from U.S. Gauge. The company has consolidated its offering into a product guide that provides simple and quick reference to the various product series. 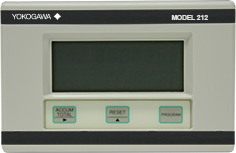 The product guide also includes diaphragm seals and a range of electronic indicators, as well. 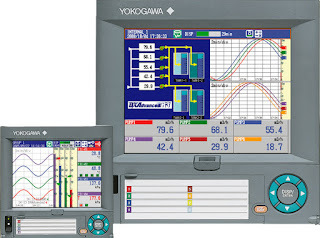 The guide illustrates gauges for every industrial application. Share your process measurement and control challenges with product application specialists, combining your process knowledge with their product application expertise to develop effective solutions. 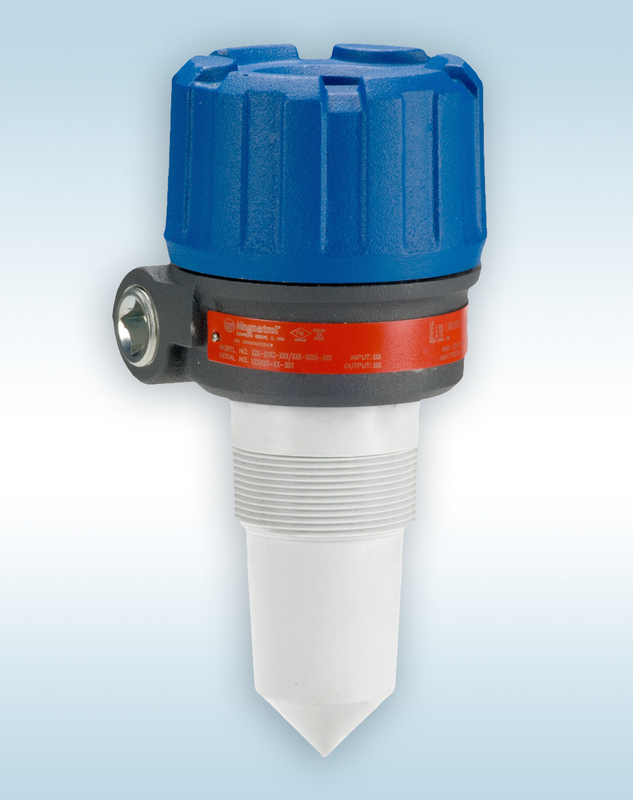 Product guide for industrial gauges from Ametek U.S. Gauge from Miller Energy, Inc. 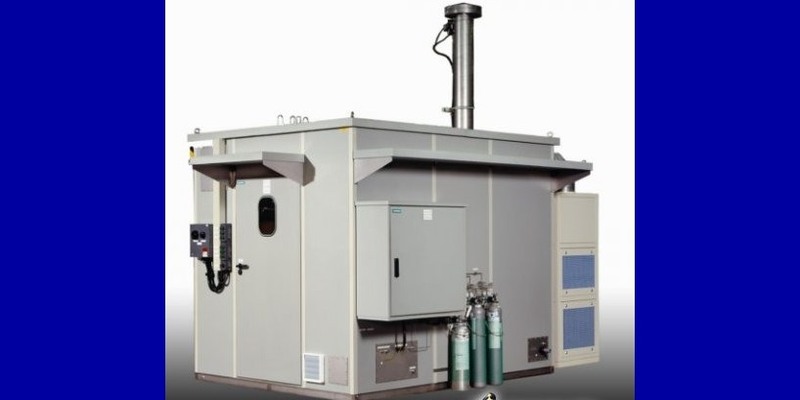 Monitoring compressed air usage in a factory or other operation where it is consumed is essential for proper system maintenance and attainment of energy efficiency goals. The ability to track down leaks and monitor compressed air usage enables stakeholders to work toward maximizing the return on an asset with substantial initial and operating costs. Easy installation and simplicity of operation are advantages for any instrument applied in this manner, making compressed air flow measurement a good application for a thermal dispersion flow meter. With no moving parts and a simple operating principal, a thermal dispersion flow meter can be quickly installed and put into operation. 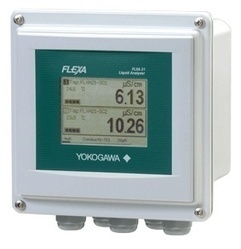 A digital display of the flow measurement provides local information, and a networking connection or other signal output can provide for remote or centralized monitoring and data collection. A cut sheet is included below that provides detail on technological, operational, and installation aspects of this simple and effective instrument. Share your flow measurement challenges with application experts, combining your own process knowledge with their product application expertise to develop cost effective solutions. 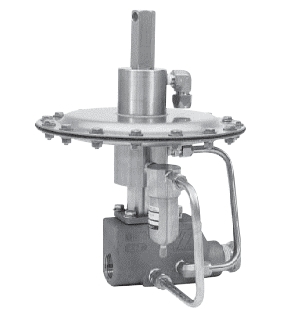 Thermal Dispersion Mass Flow Measurement from Miller Energy, Inc. Here is a two part tutorial showing how to setup your United Electric Series One Safety Transmitter. If you need any additional help or product information, reach out to a product specialist. 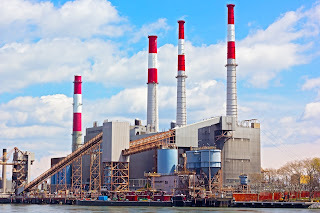 Industrial history is replete with examples of catastrophic accidents. New safety technologies exist today that can prevent or mitigate mishap and disaster in fluid processing and other operations. Modern philosophy of plant safety brings a focus on a proactive approach. Process operators have a new sense of urgency to bring increased levels of safety to their operations. 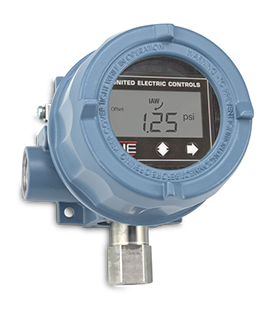 The United Electric Controls (UE) Series One is a SIL-certified (Safety Integrity Level) transmitter designed solely for safety, alarm, and shutdown. With reliability, speed, and reduced nuisance trips an integral part of its design, the Series One is suitable for application in new installations, or easily integrated into existing operations. 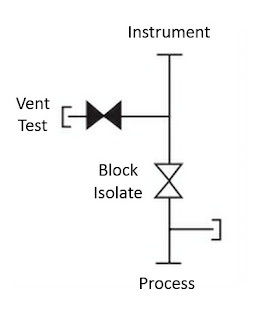 A typical safety loop consists of sensors (such as a pressure or temperature transmitter), controllers, and final control elements. Most SIL-rated pressure transmitters require 300ms to communicate with the controller, then up to 500ms for the controller to send a signal to the final control element (such as a valve). This combined response time may insufficient for some applications. Incorporating the One Series Safety Transmitter, directly connected to the final control element, the total signal time is reduced to 100ms - a large and significant time savings when safe operating conditions have been breached. 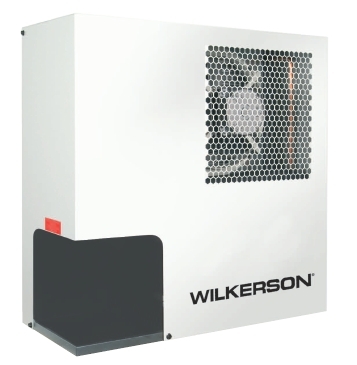 When used with blowers, pumps and compressors, the One Series makes up a complete safety system with a self-contained sensor, controller, and final control element (the switch) capable of SIL2 without additional safety instrumented function (SIF) components. The below document provides detailed information about the Series One. Share your process safety challenges with the instrumentation specialists and combine your process knowledge with their product application expertise to produce effective solutions. 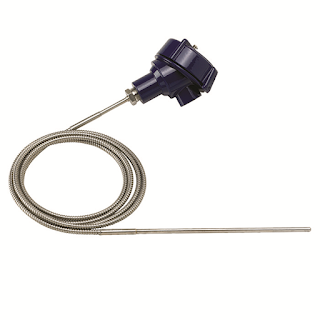 Safety Transmitters for Temperature and Pressure from Miller Energy, Inc. Measurement of pH/ORP is a common operation throughout a number of industries. Obtaining true measurements and making correct interpretation of the results can prove challenging without solid working knowledge of the methodology and procedure involved. Certain effects have the ability to cause problems if not taken into consideration. The book provided below, authored and provided by Yokogawa Electric Corporation, provides a comprehensive understanding of pH/ORP measurement and how to achieve reliable results. Basic information on the principles of measuring pH/ORP, construction of the sensing elements, and their basic use in process applications is provided. 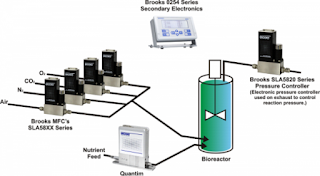 A part of achieving accurate and reliable pH/ORP measurements includes the provision of sufficient electrode strorage conditions and proper maintenance. Prevention of common errors during maintenance and storage, as well as consistent detection of loop failures is important. This book describes how to avoid pitfalls and detect failures. The book is accompanied with a frequently asked question and answer section as well as an appendix that includes helpful information like a Chemical Compatibility Table and a Liquid-Application-Data-Sheet, which can be used to describe the user’s application. pH and ORP Measurement Handbook from Miller Energy, Inc. Probably the greatest advantage of this method of liquid level measurement is that the liquid does not contact the sensing instrumentation. The only portion of the apparatus in contact with the liquid is a tube immersed into the tank. Basically, a purge gas flows through the immersion tube and may bubble out the immersed end of the tube, which is open to allow the contained liquid to exert a hydrostatic pressure on the purge gas. The back pressure on the gas that is exerted by the liquid contained within the tank will vary directly with the depth of the liquid. The back pressure can be correlated to a liquid level. Further calculations, which would include the tank shape, dimensions, and the liquid density can provide an indication of the volume and mass of the liquid. 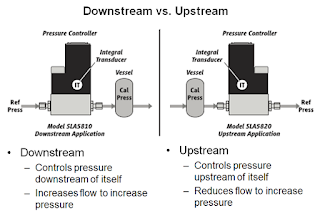 Here is an illustration of the setup, provided courtesy of Brooks Instrument, globally recognized leader in flow and pressure measurement and control. The illustration is from Brooks' January blog article. Bubbler Method Tank Level Measurement Apparatus, showing application of some Brooks Instrument devices. 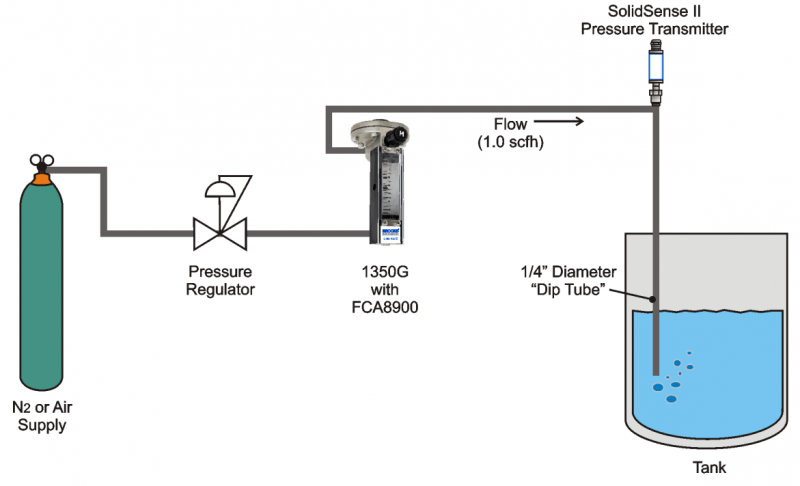 Below are data sheets detailing the components used in the system to control and measure the gas flow, and measure the back pressure on the immersion tube. There are other components needed for a complete system, but they are fairly generic in nature and easily obtainable. Contact a flow and level measurement specialist with your application challenges and work with them to produce effective solutions. 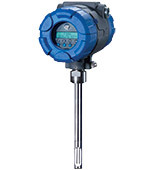 Bubbler Method Liquid Tank Level Measurement Instruments from Miller Energy, Inc.